The Laboratory Concrete Mixer is used for preparing Mix Design of Concrete. It consists of a steel vessel of 55/ 110 Litres capacity, mounted on a frame. The vessel is rotated at 20-22 RPM with the help of a motor and a pulley arrangement. The vessel of laboratory concrete mixer can be titled to any angle by a hand wheel and counter weight. This facilitates mixing and discharge. Blades are provided inside the vessel to mix the material thoroughly. The large pulley wheel facilitates manual rotation of the drum during the power failure. The drum, pulley wheel, and motor, etc, are mounted on a steel frame in these laboratory concrete mixer. The concrete mixer is fitted with ½ HP motor. 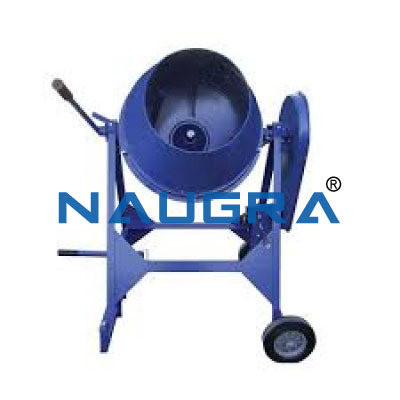 We are leading manufacturers, suppliers & exporters of Laboratory Concrete Mixer. Contact us to get high quality designed Laboratory Concrete Mixer for schools, colleges, universities, research labs, laboratories and various industries. We accept bulk orders for government tenders in all countries around the globe. For similar products visit at main page of Concrete Laboratory.